FREE event with our military spouses! 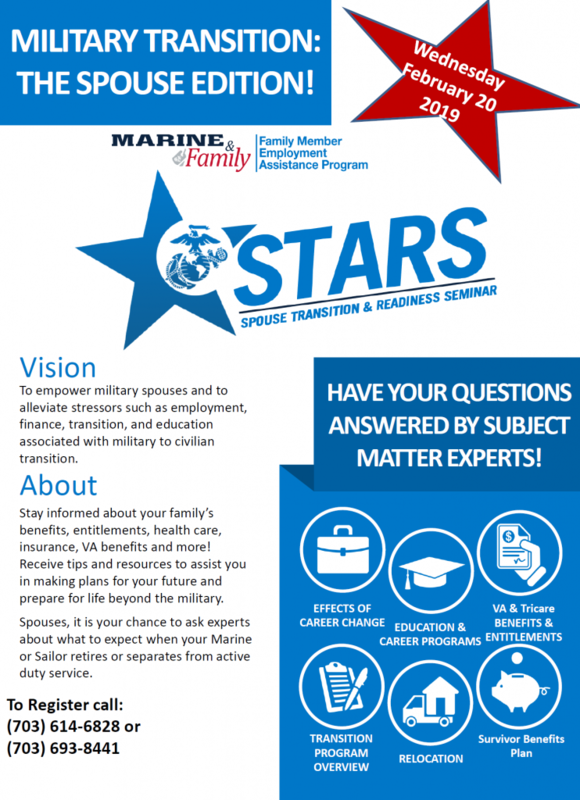 The Spouse Transition and Readiness Seminar scheduled for Wednesday 20 February 2019, will prepare spouses for transition from military to civilian life by providing information on Tricare and VA benefits that they may be entitled to; educate them on survivor benefits plan and deadline for accepting this benefit; employment opportunities, etc. ALL BRANCHES ARE INVITED AND SPOUSES CAN ATTEND AS EARLY AS TWO YEAR PRIOR TO DATE OF EXIT. Spouses can also attend this one day seminar multiple times.